New research from Whitman College shows, through extensive personal interviews with former gang members, the transformative potential of tattoo removal as a method of gang transition. However, even for those who went through the process of removal, important barriers still remain. Community Partners: INK-OUT, Walla Walla Public Schools. TOPIC: This study investigates the Walla Walla INK-OUT program as a case model illustrating gang members’ motivations to get their tattoos removed, as well as an opportunity to evaluate tattoo removal as a particular strategy for gang transition. Our team conducted the research in partnership with Sergio Hernandez, the INK-OUT founder and Diversity Committee Chair for the Walla Walla Public Schools. METHODS: We interviewed nearly every INK-OUT participant that had applied for the program between September and December 2013, as well as several of their mentors. We inquired about participants’ upbringing and experience in schools, their motivations for joining a gang and getting their tattoo, relationships with and attitude towards the rest of the community and reasons for leaving their gang and getting their tattoo removed. We spoke with community members such as police officers, a probation officer, a high school intervention specialist, and the doctor who performs the removal surgery to inquire about the perception of gangs in Walla Walla, how INK-OUT has been received, and what further action community leaders believe is required. Extensive secondary research on gangs provided an important framework for our decision to highlight the stories of participants. Many gang members grew up with inconsistent role models and substance or physical abuse. School was often a site of further isolation and stigma, as teachers and administrators frequently dismiss gang members as inherently criminal and not capable of academic success. A desire for kinship can motivate young people to join a gang. Additionally, young people perceive gangs as a place where they can find refuge from community stigma. Ironically, being in a gang often results in additional alienation because of negative attitudes locally towards gang members. Many gang members leave because of an aversion to gang violence, feelings of betrayal within the gang, and the desire to protect family and loved ones. Tattoo removal is a highly effective method of removing markings of past affiliation, but it cannot address other important needs following disaffiliation like job training and counseling. Incorporate lessons on the adversity facing gang members during cultural competency training in public schools on how to avoid further alienation of these youth. Avoid zero-tolerance policies. Strive to hire more teachers of color, especially Latinos/Latinas, to act as positive role models. Expand its services to include job training, counseling and case management. Include INK-OUT “alumni” on its committee to solicit their input on future changes, and to create a more welcoming atmosphere among prospective participants during their intake interview. Reconsider the use of zero-tolerance tactics by the Walla Walla Police Department. Allocate funding through Walla Walla’s “1/10th of 1%” tax to INK-OUT for mental health services. We encourage the County Commissioner and Public Health Department to make this change. Expand access to low-income community health centers and raise the minimum wage. Avoid punitive gang criminalization measures, and instead fund intervention/prevention efforts. 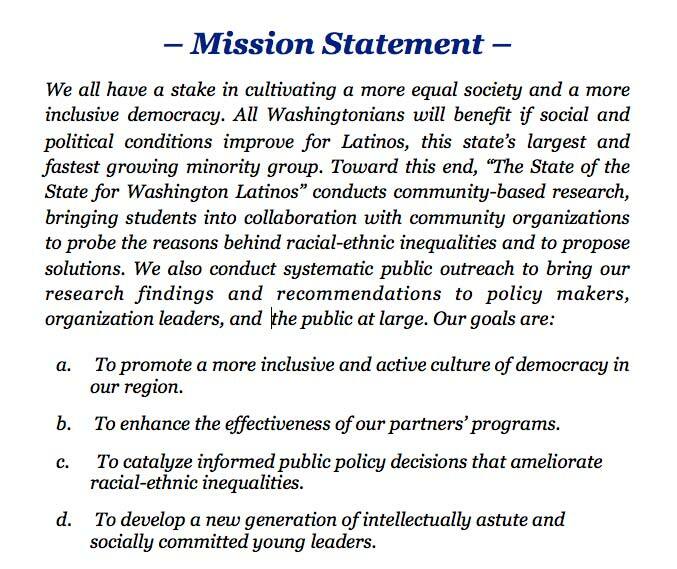 © 2019 The State of the State for Washington Latinos. All Rights Reserved.